Retay Arms is ten years old, young as firearms companies go, located in Konya, Turkey. Thay have been manufacturing a diverse array of products such as spear guns, air rifles, and blank replica semi-auto pistols. 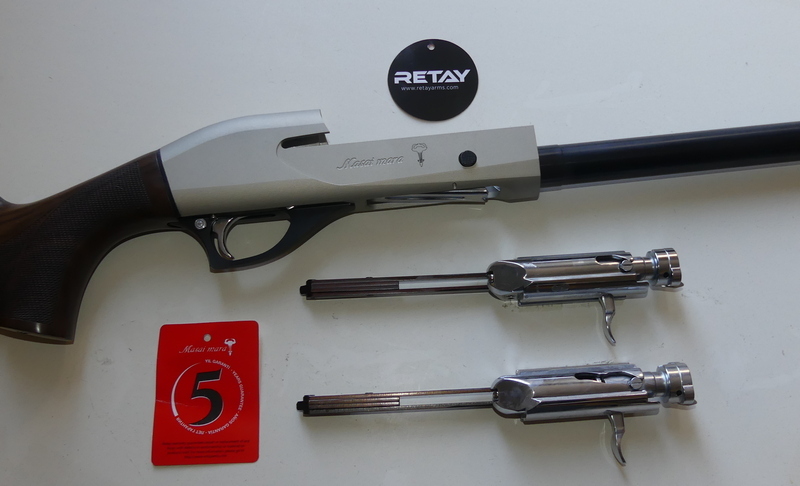 Over four years ago, Retay Arms decided to enter the semi-automatic shotgun market with their version of the Bruno Civolani inertia or kinetic action shotgun. 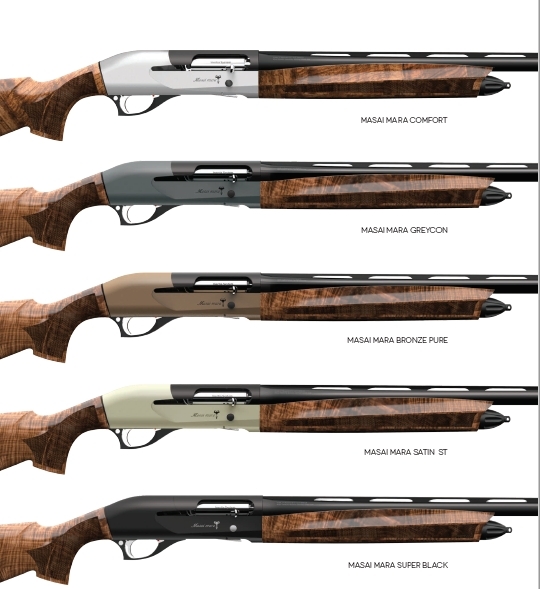 Retay wanted a better Benelli than Benelli, and they also wanted to produce a shotgun that was a clear upgrade in materials and finish than is associated with many Turkish brands. One of the worst-kept secrets in shotguns is that many companies produce shotguns in Turkey, import those guns into Italy, run them through the Italian proof house, and bingo, they have an “Italian” shotgun. The same was the case with Spain for a time. Browning buys Turkish shotguns and reboxes them. Beretta manufactures in Turkey, extensively. It wasn't all that long ago that the so-called “Made in USA” Beretta 3901 was shipped with Turkish barrels, stamped loudly right on the barrel. The so-called Italian Franchi 48AL was made in Spain for a good long while, by BBI: Beretta Benelli Ibérica. The Vursan plant in Turkey was purchased by Beretta eighteen years ago and is now known as Stoeger Silah Sanayi A.S. Like chicken, “parts is parts,” and the consumer has little chance of knowing where their shotguns actually come from in many cases. Things are rarely what they seem to be. The notion of an Italian Crime Family isn't exactly a new one or wake the President material. Perhaps, one day they will make a movie about it? With age comes wisdom, or so you might think, but not always. As Oscar Wilde wrote, “With age comes wisdom, but sometimes age comes alone.” The implication of an old company is that they always do things better, but sometimes that has proved to be “500 Years Unmarred By Progress.” With a new company, new manufacturing centers, and new tooling there is at least the opportunity to avoid the same mistakes made over and over again by the same old brands. What is new for 2018 with the Retay Arms Masai Mara? While not affecting the quality of the shotgun, Retay USA offers a five-year warranty with every Masai Mara shotgun. A warranty isn't much good if you don't know who actually handles it, though. Briley Manufacturing, Inc. of 1230 Lumpkin Road, Houston, Texas 77043 handles the warranty work and repair work. The Masai Mara is a simple, efficient design, and even though it is unlikely to need any repair, it is good to know that warranty and repair arrangements are in place through a reputable, established firm. The Retay Masai Mara captured the interest of George Trulock and family of https://trulockchokes.com/ . Trulock chokes in the process of developing a full line of extended choke tubes for the Masai Mara, with availabilty estimated to be July or August of 2018. As for the gun itself, the most significant change is the addition of the “Inertia Plus Action” to all guns shipped in the United States, the practical and affordable solution to Benelli Click Pollution. The advanced Inertia Plus Action comes at no additional cost over the standard inertia action that came with the first two Masai Mara models that I have tested. The Benelli Click is extremely well-known and it just means a less reliable gun. It hardly happens all the time, but if the bolt is jostled out of battery, a Benelli will not go bang. That's actually a good thing, for no one wants a shotgun that fires out of battery. But, the Benelli click has been unfortunately at the forefront of unintended waterfowl conservation too many times. All it has to do is cost you one duck or one pheasant, and you won't be happy and won't forget it. I have a tremendous disdain for center beads on hunting shotguns. Thankfully, the Masai Mara does not come with one. I also resent Christmas Tree size globes on the muzzles of shotguns: they are distracting and serve no purpose. The first MM shipped in this country that I reviewed had, as far as I'm concerned, an excessively large front bead. That has been changed, or the better, with a significantly smaller bead. It is standard practice among many competitive shooters to take off the front bead of their O/U shotguns, and throw it in the garbage can, then moving the smaller center bead from the center to the muzzle. It isn't rational to seek MOA accuracy with a 70 MOA bead, even though the front bead on a shotgun is just a peripheral reference point, with your hard focus always on the bird. 2018 Masai Mara shotguns are shipped with Truglo Starbrite Deluxe front beads, Truglo's smallest front bead which is .060 inch in diameter. That's a good thing. The 2018 oil-finished Masai Mara walnut stocks are beautifully done by Minelli of Italy, with what they call “extra oil.” Extra oil is just a way of saying properly oiled, with no open pores. Many oil-finished stocks out there are far too dry and that means they are prone to water-spotting and so forth unless finished before you use the gun. Additionally, dry stocks sometimes have a rough, almost sandpapery texture which makes them less comfortable to shoot. They can give you “razor burn,” for lack of a better term. A properly oil-finished stock is smooth against your face, and extemely comfortable to shoot as a result. 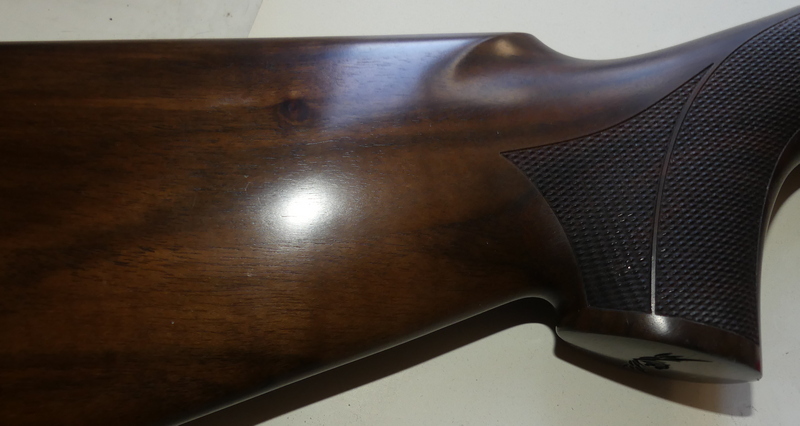 Compression of the recoil pad means that there is some sliding of the comb against your cheek and with all the pores filled in walnut, it is a pleasure to shoot the gun. The Masai Mara for 2018 retains the machined alloy trigger group, that is removed with the push of a button with no tools required, and no pins to knock out. A full battery of stock shims is supplied for the adjusting of cast and drop. Drop at the heel is 2.16" ±.04 adjustable to 1.77"-1.96"-2.36"
Drop at the comb is 1.45"±.04"
The ventilated rib is 8mm wide, wider than the standard 6mm hunting rib, and he gun has a 3 inch chamber. Available barrel lengths are 24, 26, 28, and 30 inch. This 2018 Masai Mara Satin is a far better looking gun than the poor catalog photo (above) suggests. I like it better than the bright silver receiver. As far as I'm concerned, the Bronze Pure and Satin models that are both Cerakote along with the flat black anodized oiled walnut models are all strikingly handsome. They all come with polished blue barrels. As tested, this Masai Mara Satin 28 inch weighs 6 lbs., 14 oz. The trigger is a bit too heavy for my tastes, breaking at 6 lbs. or so. While the charging handle bolt is generous oversized, not so with the cross-bolt safety that is a bit too small. This gun does well with 1 oz. 1180 fps shotshells, with positive ejection. As for lighter or trainer loads, I do not bother with them so I'll leave it to others who want to shoot 28 gauge or 20 gauge target loads out of 12 gauges. You can include me out on that. I prefer the 26 inch barrel for upland hunting, but others may well opt for the 28 inch if they enjoy some clays and they do more dove hunting than anything else. The “in your face” grouse and quail aficionados may well want a 24 inch barrel: that's why they call them choices. In times past, Turkish made autoloaders have largely ranged from the wonderfully adequate to the truly tragic, with some exceptions. New to the American market, the Masai Mara has already been well-received in Canada, Russia, and in various parts of Europe. Right now, though, the Masai Mara oiled walnut / polished blue shotguns are the best-looking semi-auto shotguns that can be had for under a thousand dollars, with estimated street price of this premium Masai Mara Satin at around $950. With the Inertia Plus action that is more reliable than than standard inertia action, it is not just the best-looking , best-finished repeater you can buy for the dollar, it is the most reliable inertia gun for the dollar you can get as well. That is what I call a winning combination. To order yours today, contact Chris Handy at chris@thomasferney.com . Retay Arms exhibited at the SHOT Show, just recently at IWA in Germany, and they will be at the NRA show in Dallas as well.